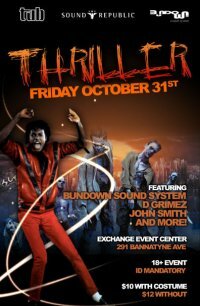 Thriller returns for another frightful and funky fete. Wow. Crazy dope numbers @ the door, folks! Thanks for comin’ out & makin’ THRILLER that much doper! Bigup Sound Republic (Stephen) & TUB (Kevin) but most especially all y’all (600+). Sorry to those that were unable to get in; we did advise you reach early. Unforch, the MLCC paid us a visit – resulting in us paying a fine for over-capacity. Next yr…we go bigger! To see THRILLER flix, search “thriller” or “halloween 08” on Facebook or check the profiles of Jay Boogie, Quadratik aka Jus Villa, Ofield or Manic (Leo)! The pretty mess that was last Halloween’s dopest party will be back bigger and better as we welcome KEVIN TROSKY and The Urban Bakery into the fold for what will surely be this year’s funkiest soulshot out the “Gate Night”! You know all you really need is some BUNDOWN action but for some added icing we will be joined by local rap heavyweights JOHN SMITH and D. GRIMEZ. TUB! SOUND REPUBLIC! BUNDOWN! THRILLER! Need any more convincing…? Tickets are $10 with a costume and $12 without and it will be strictly door admission, which means if you sleep, you could be waiting in line…which would be such a shame if your costume happens to be skimpy. 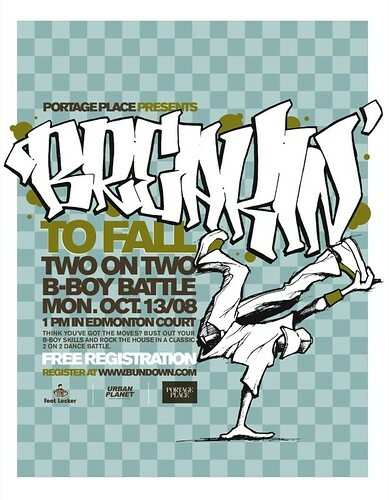 In the interest of sharing Winnipeg’s b-boy culture with a greater audience, we initiated the BREAKIN’ TO SPRING 2-on-2 in March with Portage Place Shopping Centre. The winner of BREAKIN’ TO SPRING was none other than B-Boy Seven and B-Boy Arnski (representing DANGEROUS GOODS COLLECTIVE). …with a live remote on HOT103! …check out footy & flix from BREAKIN’ TO SPRING.